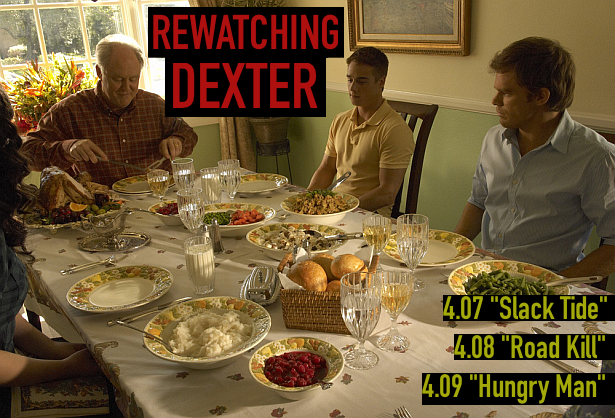 Dexter Daily: Rewatching Dexter - 4.07 "Slack Tide", 4.08 "Road Kill", 4.09 "Hungry Man"
Rewatching Dexter - 4.07 "Slack Tide", 4.08 "Road Kill", 4.09 "Hungry Man"
Rewatching Dexter by DexterDaily. A look back at the past seasons of 'Dexter' and our favorite serial killer's victims. Today, we're going to remember the episodes: 4.07 "Slack Tide", 4.08 "Road Kill", 4.09 "Hungry Man". Hit the 'read more' button for more! Dexter finds himself enjoying a brief moment of tranquility. He's finally managed to strike a balance between work, family... and other pursuits. But he's keenly aware that times like these aren't meant to last. When Miami Metro discovers a string of murders connected to a prominent photographer, Dexter sees an opportunity for a clean kill. However, his plans seem to be thwarted every step of the way. Quinn has taken a renewed interest in Dexter's nightlife. Dexter's plans to keep Astor and Cody distracted with new activities soon backfire. Even Harry disapproves of Dexter's choice of pastime, urging him instead to focus his efforts on the Trinity Killer. Meanwhile, Debra returns to work, frustrated to find everyone treating her with kid gloves. She decides to concentrate on her pursuit of the Trinity Killer as well as delving into her father's checkered past — investigations which Dexter fears might lead her to danger — or worse, the truth. Dexter's victim: Jonathan Farrow. Photographer. (Not a killer). Decapitated. 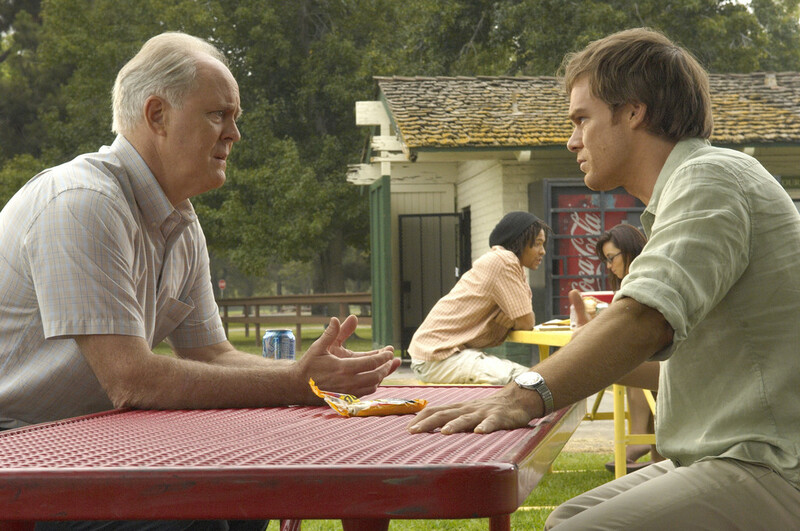 4.07 "Slack Tide": Original Air Date: November 8th, 2009. 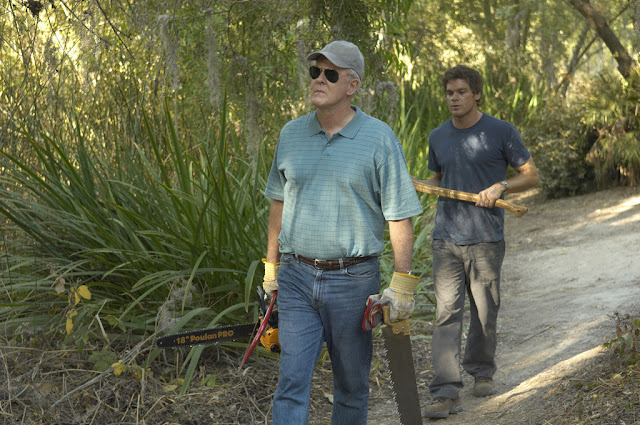 Dexter has always known his father's Code was meant to protect him from exposure. But after committing a serious mistake, he wonders if it could have been designed to protect him from something even more dangerous - human emotion. When he discovers that Trinity is planning an out-of-town trip, Dexter sees an opportunity to ride along and gain insight into the mind of a fellow monster. Even so, Dexter isn't prepared for the startling revelations Trinity makes along the way, revelations about his own past which only serve to convince Dexter of what he must do. Meanwhile, back at Miami Metro, Debra refuses to let a technicality keep her off the Trinity case. She works through others to ensure her voice is heard — that is, until she realizes that her single-minded pursuit of the Trinity Killer may have blinded her to the truth. 4.08 "Road Kill": Original Air Date: November 15th, 2009. For most people, Thanksgiving is a time for traditions and family. But for Dexter, it's an opportunity to get closer to his most dangerous adversary yet. As Dexter gains insight into Arthur's psychology by studying those closest to him, he finds himself drawn into a bizarre and twisted world. Meanwhile, Rita has her hands full preparing dinner for a packed house, including a few unexpected guests. Batista gets closure on an old case, while Debra uses the holiday to continue her investigation of the Trinity Killer, a pursuit which threatens her brother's safety and brings to light surprising revelations about someone else close to her.